1 foil stamped area on Side 1 of uncoated 100lb Deep Black Linen stock. C1 business card slits on right pocket. Brainworks' crooked, playful logo looks handwritten, symbolizing creativity and artistry. A black background paired with Metallic Silver foil stamping creates a high-end look to offset the eclectic typography. Linen stock lends texture to the design to engage recipients' sense of touch as well as sight. The plain interior puts all attention on the documents in the box pockets. Four-color process printed on Side 1 of 12pt C1S Semi-Gloss stock. Coated with Aqueous Satin. H3 business card slits on right pocket. 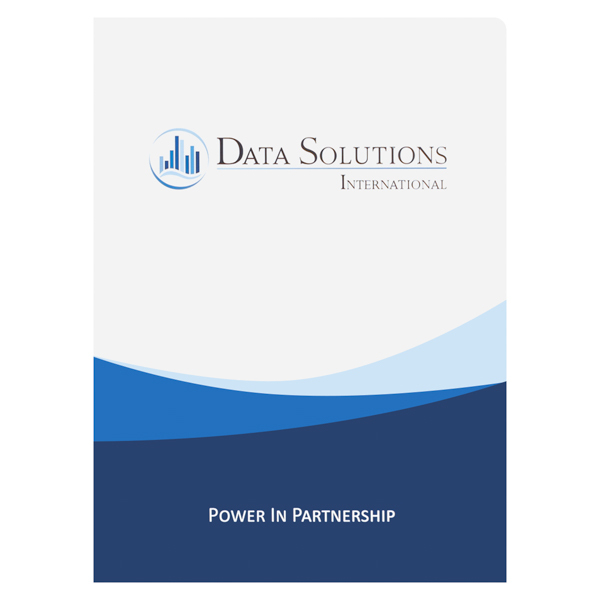 Blue waves swirl across Data Solutions International's design, matching the brand logo. The popular combination of light and dark blues sends a message of reliability and versatility, while also reinforcing the brand's role as a tech company. The logo and contact information on the back cover and pockets reiterate Data Solutions' identity. Side 1 printed with 1 blind embossed area. 100lb Smooth White stock uncoated. A creative resource for advertising professionals, Lurzer's Archive designed a piece that's sophisticated, stylish, and a little unconventional. The panels' white stock is smooth and modern. Lurzer's logo is embossed onto the cover, giving it a raised texture that relies on light and shadow for visibility. Its use of texture and stark white panels give this design a one-of-a-kind look worthy of a creative business. 1 embossed area on Side 1 of uncoated 100lb Deep Pine Linen stock. 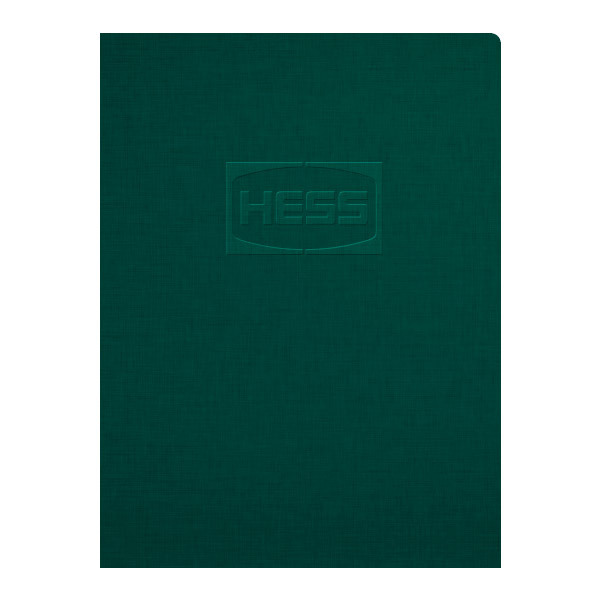 Rich green stock presents the eco-conscious side of Hess, an integrated oil company headquartered in New York City. Its color alludes to growth, nature, and security. The blind embossed logo is both prestigious and eco-friendly, as no ink was utilized in the printing process. Audiences can connect with the raised logo's texture on both a tactile and visual level for interactive, increased brand recognition. This product's double-score backbone allows each of its two box pockets to accommodate presentation packets up to 1/4" thick, for a combined total of 1/2" carrying capacity. Its pockets are v-split along the inner edge, giving them the flexibility they need to hold 8 1/2" x 11" catalogues, pamphlets, and brochures without buckling. Its rounded corners complete the design with a modern style and prevent the covers from dog-earing. Dimension Open: 18 1/2" x 12"